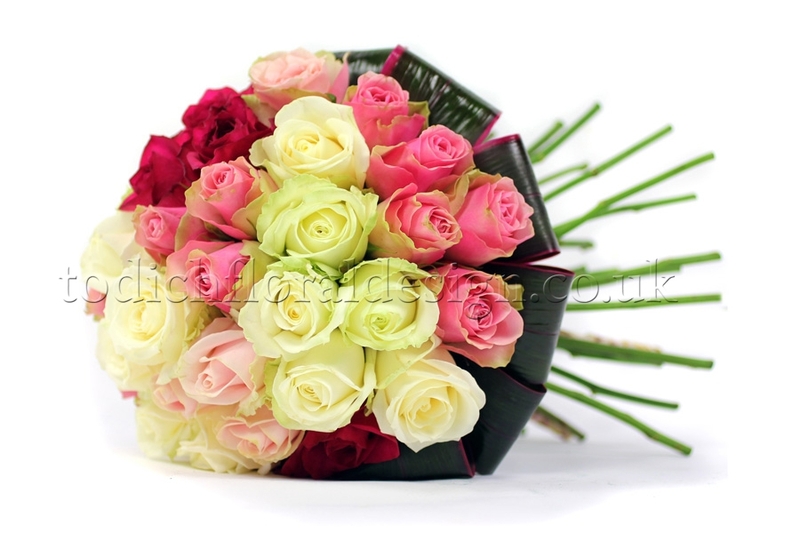 A formal-looking bouquet of roses or a more casual posy of mixed flowers? 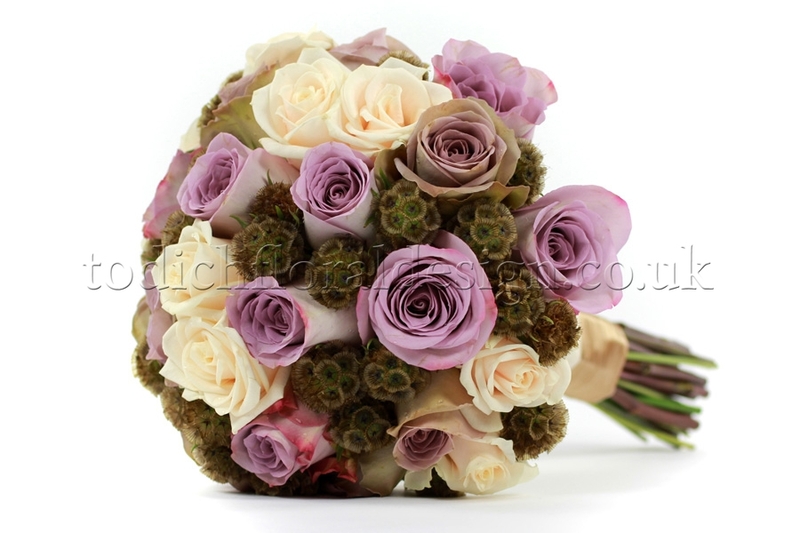 The choice is daunting when it comes to choosing the flowers for your wedding. 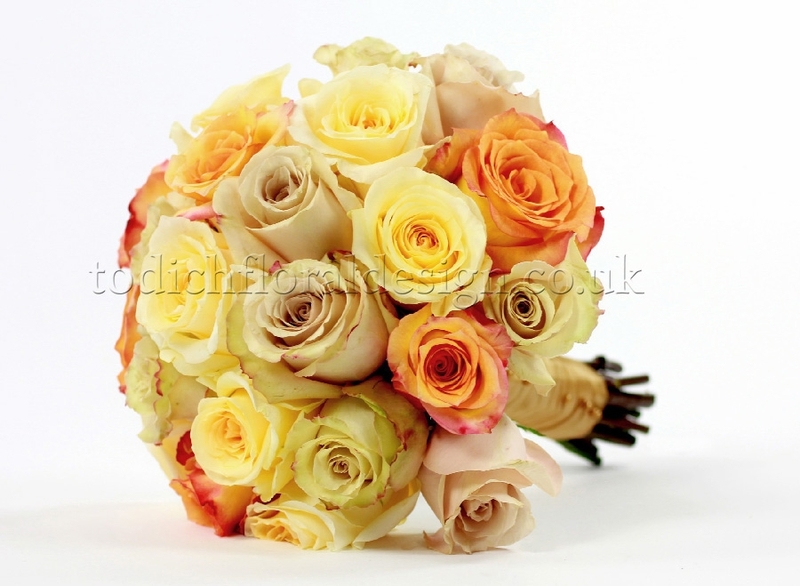 Which colours, shapes and sizes will best suit the bride and the attendants? 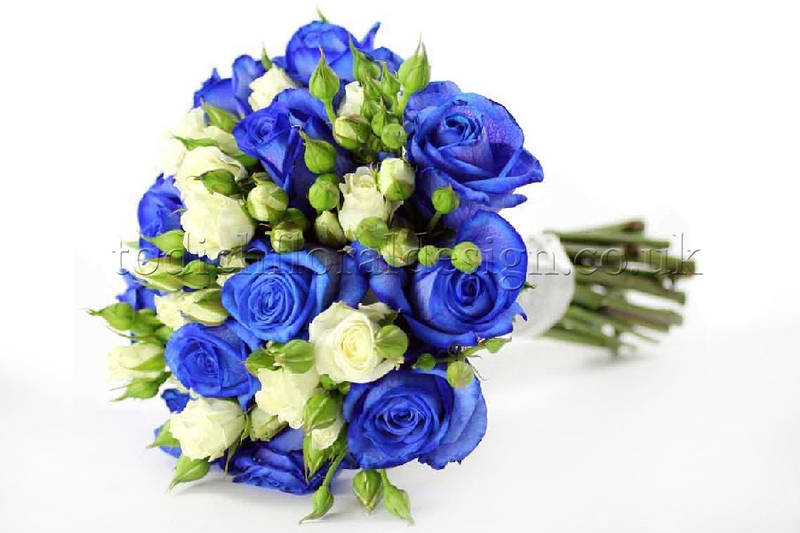 What flowers are in season? 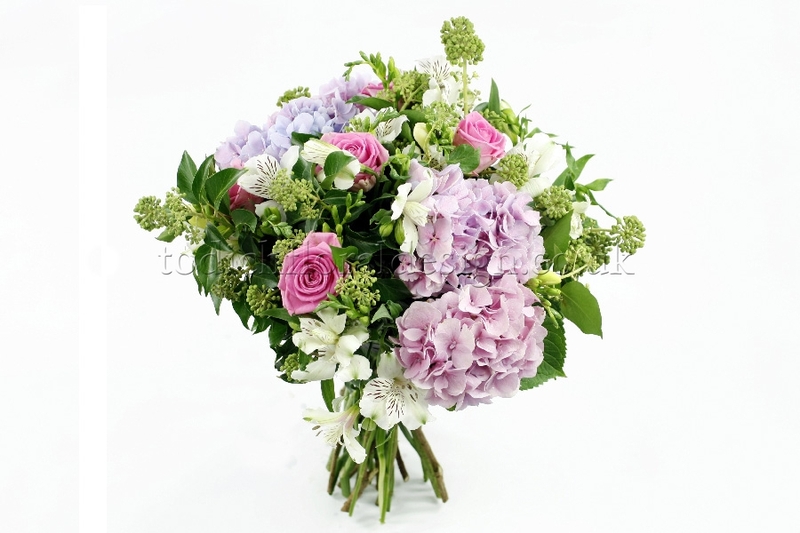 Call (0800 781 8877) or email Todich Floral Design and we will be happy to answer all your questions and get you on the right track. 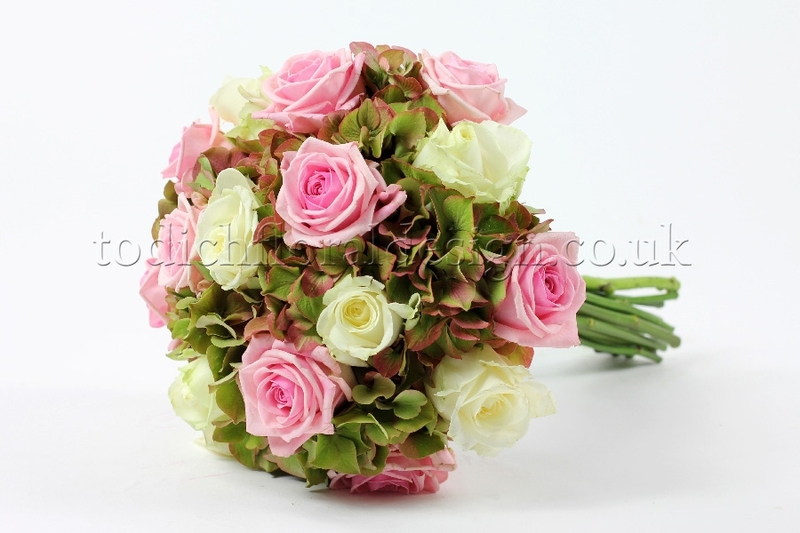 Flowers are an important part of your wedding and there are many options available to you. 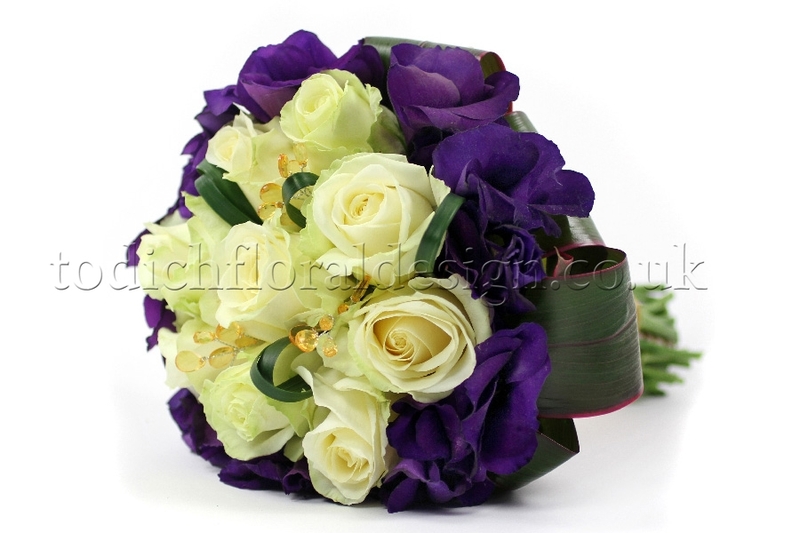 With a little planning, and help from Todich Floral Design your wedding flowers experience will be a very pleasant one. 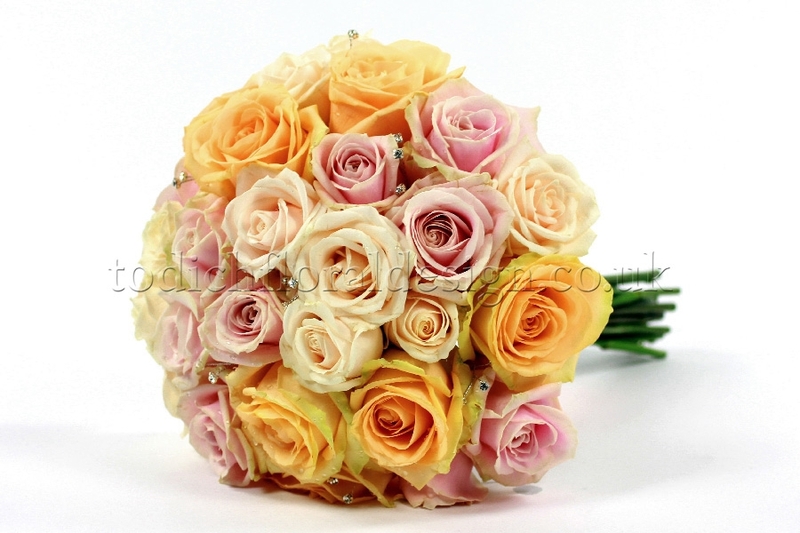 A recent public opinion poll conducted by FTD, Inc., the world's largest floral company, discovered that roses are the most popular flowers for the ideal wedding. 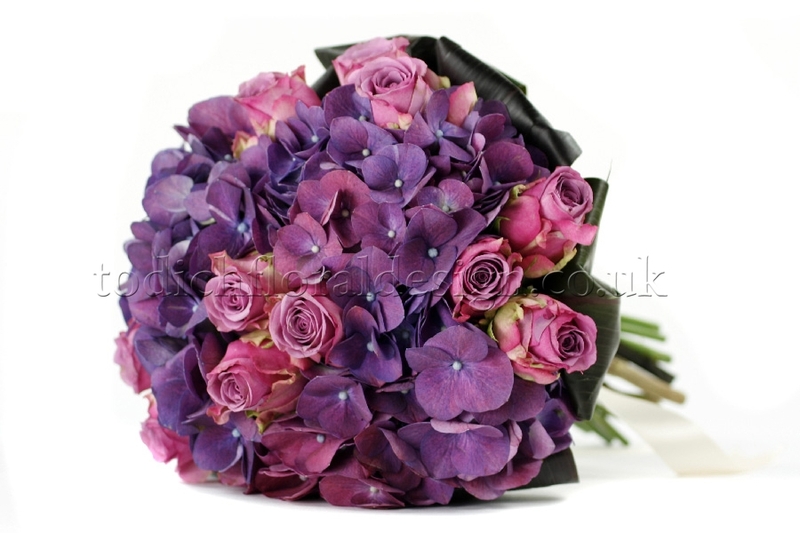 Instead of paper confetti, a shower of flower petals is a most romantic ceremony send-off. 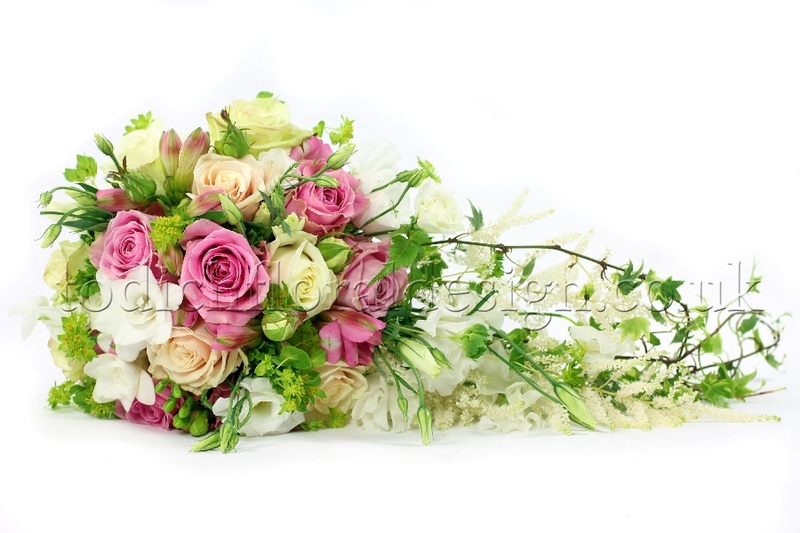 Flowers have always been used for decoration at weddings. 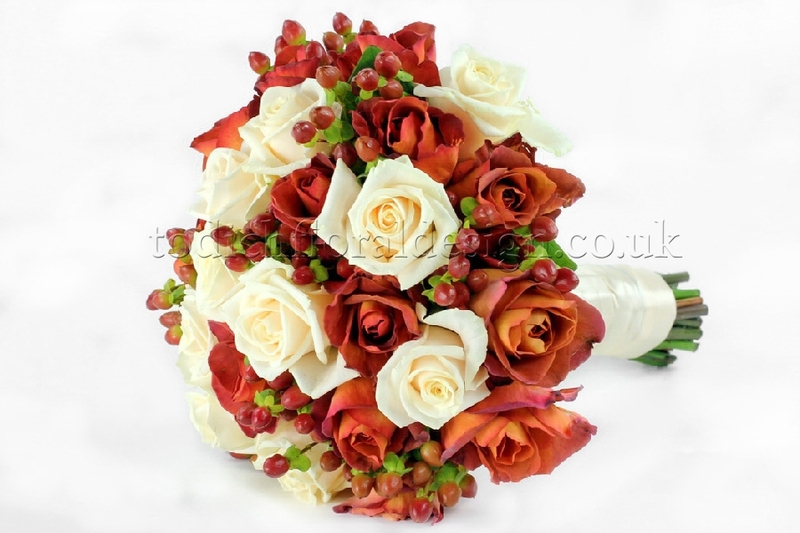 Bridal bouquets, buttonholes for men and table decorations are just some of their uses. 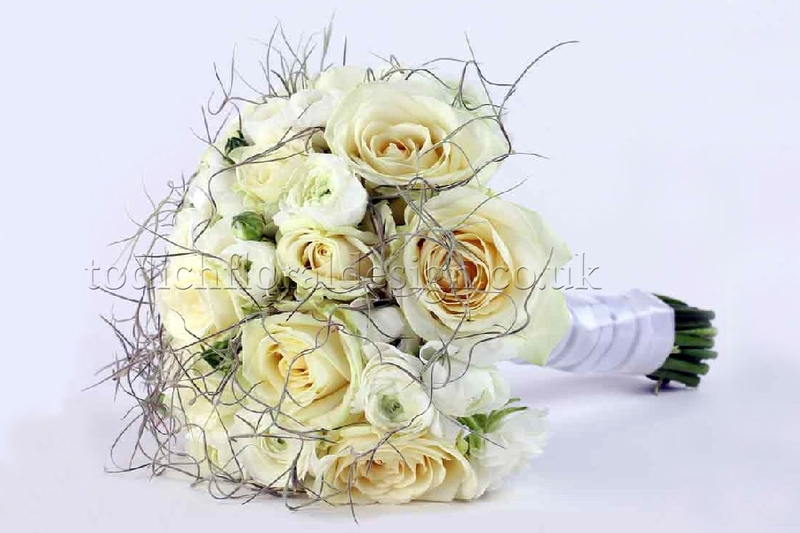 At one time the bride's flowers had to be white, but this no longer applies and any colour flowers can be used. 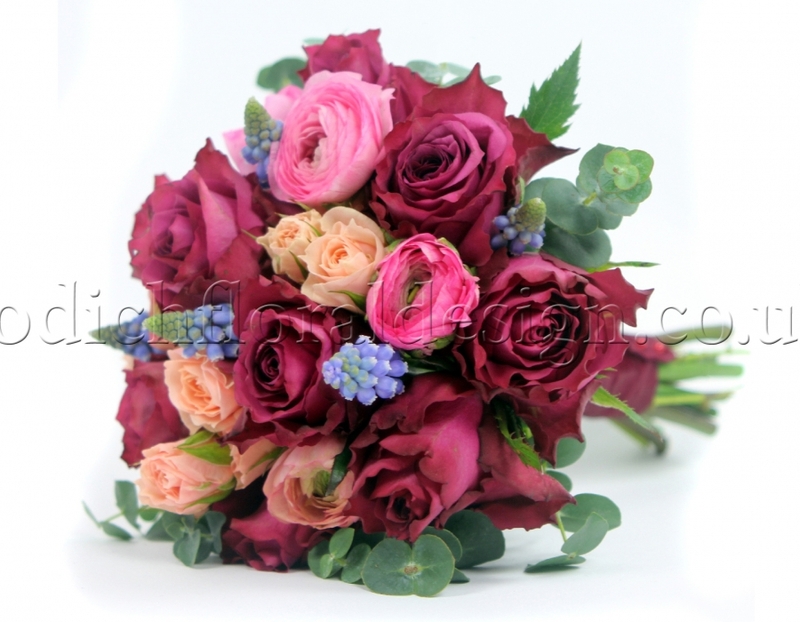 The bride and bridesmaids usually carry bouquets or posies, and the bride may choose to wear one or more flowers in her hair or on her headdress. 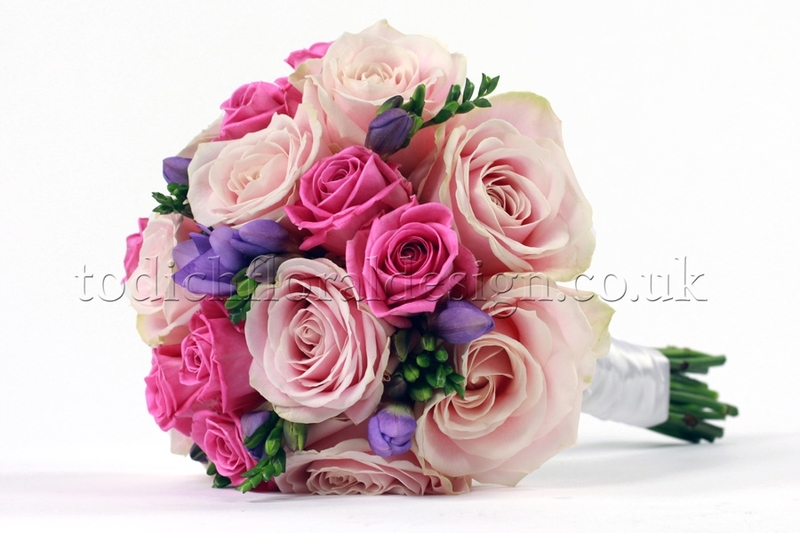 Some people refer to the symbolic meaning of flowers when they choose flowers for their wedding. 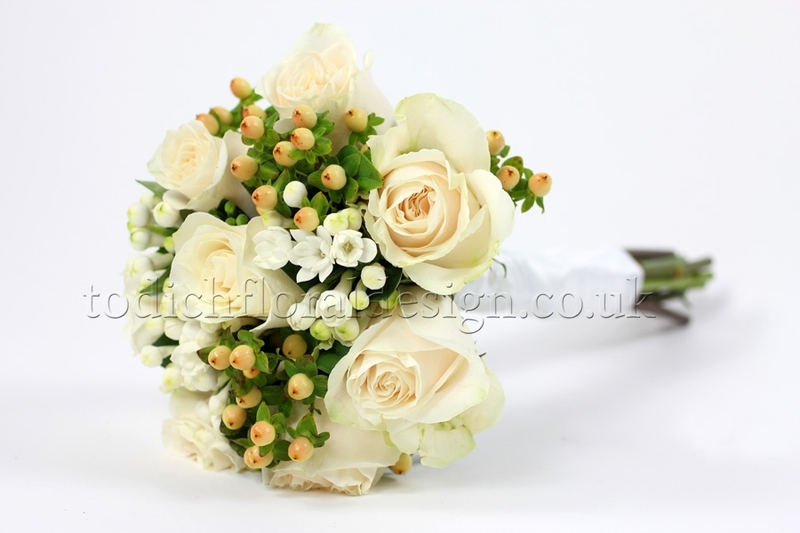 Orange blossom is one flower that has always been associated with weddings because it signifies purity and chastity. 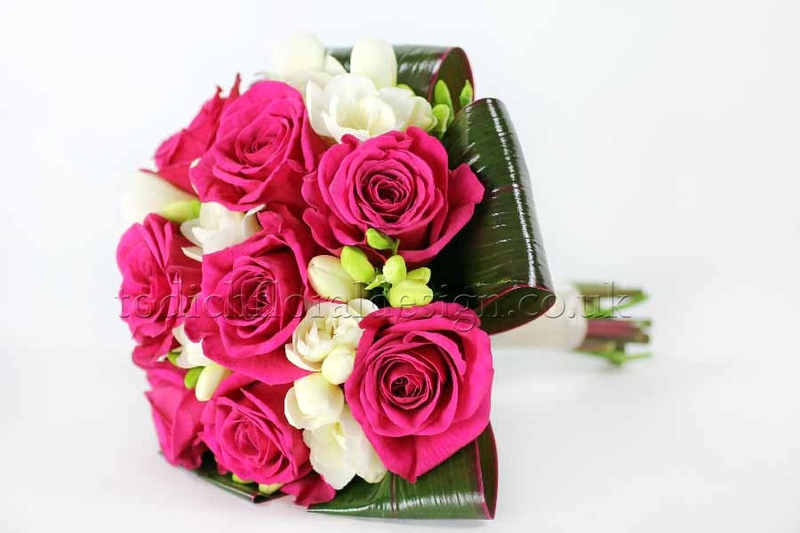 A combination of red and white flowers is often avoided as they represent blood and bandages to some people. 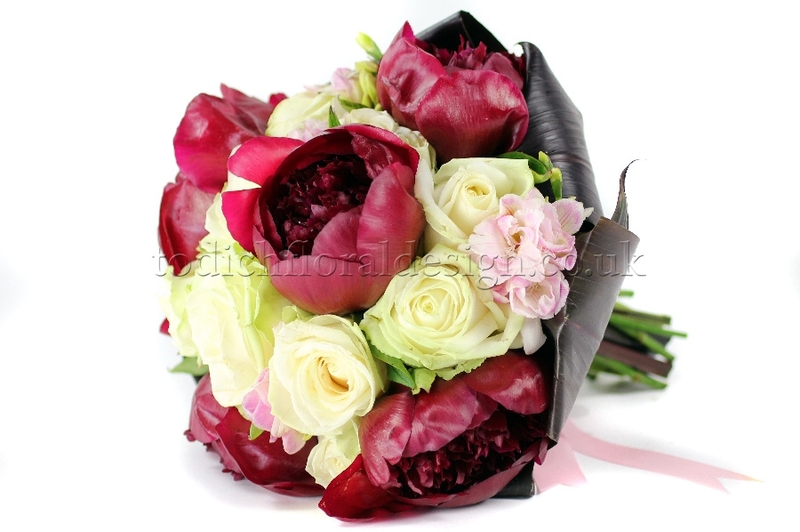 Roses are a popular choice as they represent love while some people avoid peonies as they represent shame. 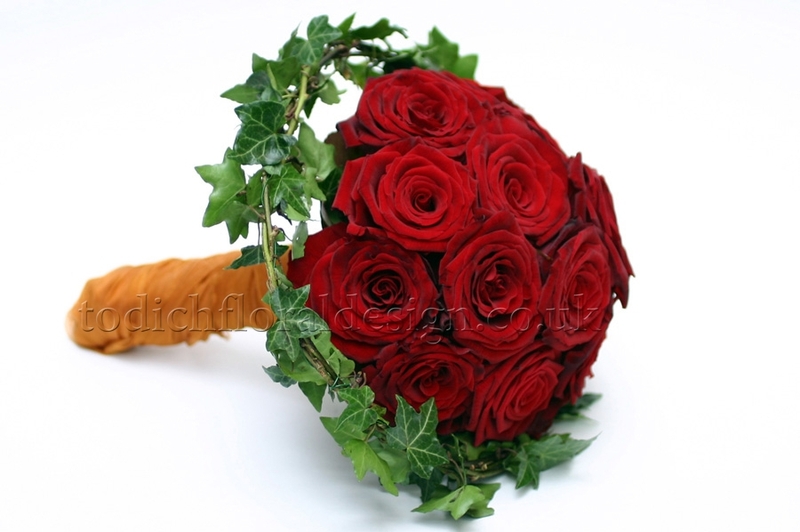 Ivy symbolises eternal love. 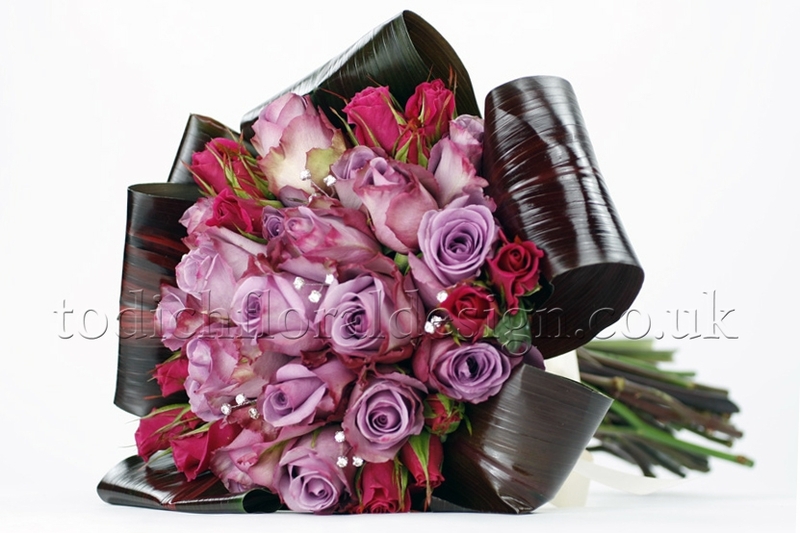 The meanings of some flowers can differ between cultures. 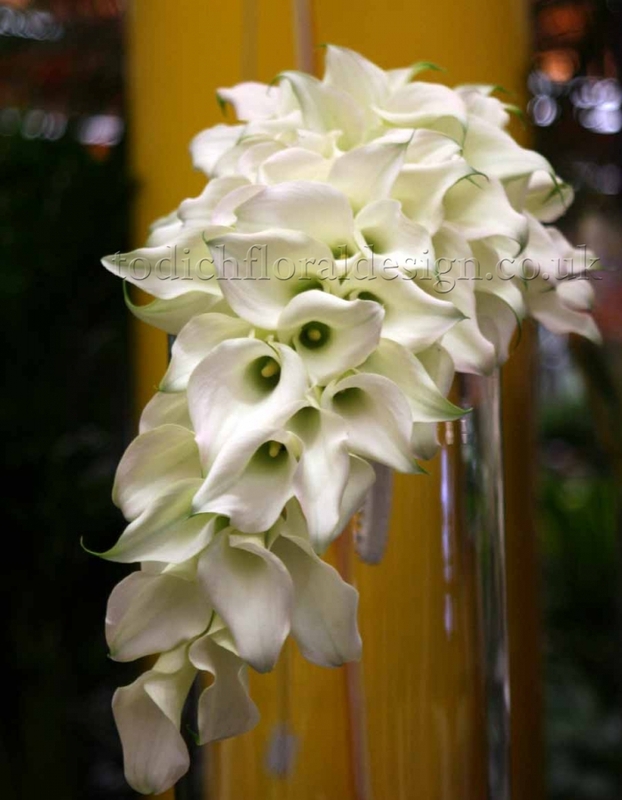 Lilies represent death to some people, while to others they indicate majesty. 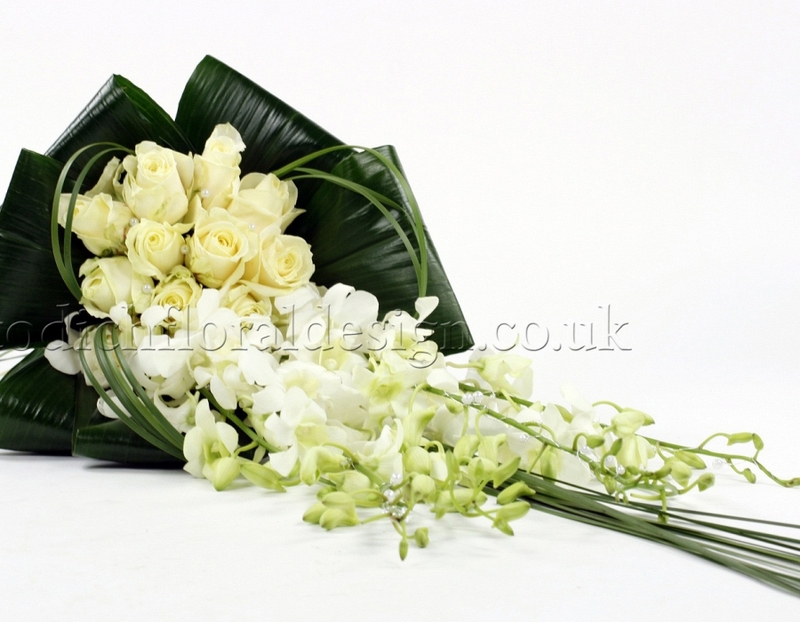 Some suggestions include choosing flowers which hold special memories or family significance. 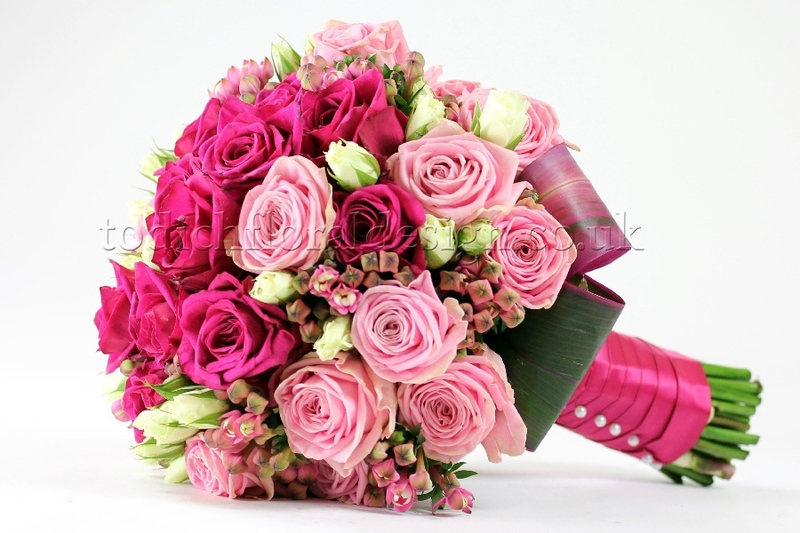 The flowers you can use on your big day will also depend on the season. 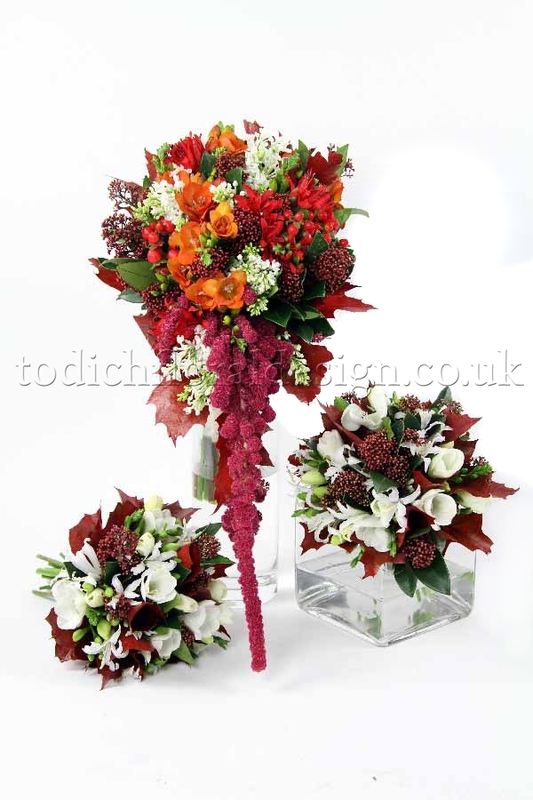 Check with Todich Floral Design as we can provide invaluable advice about colours, themes, styles, and the availability of certain flowers at various times of the year. 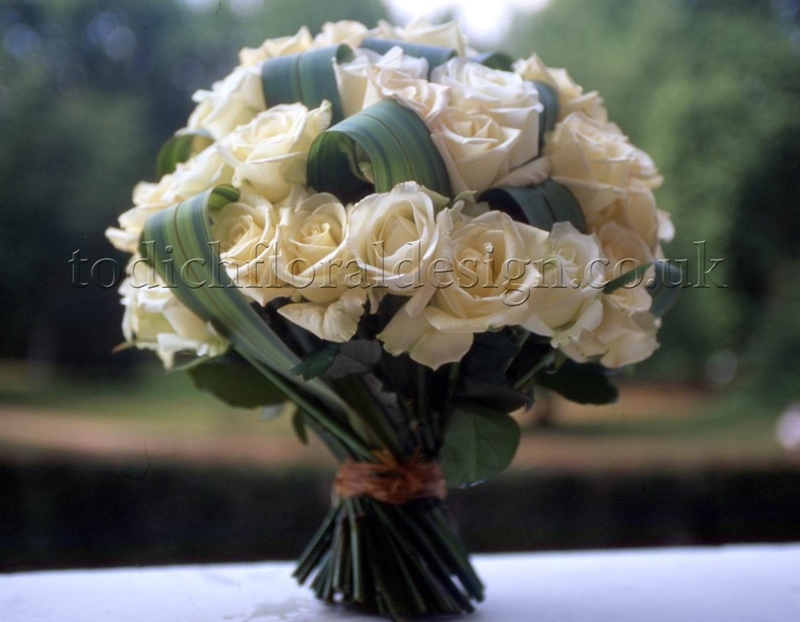 In the past the bride's bouquet was composed of white flowers to symbolise purity. 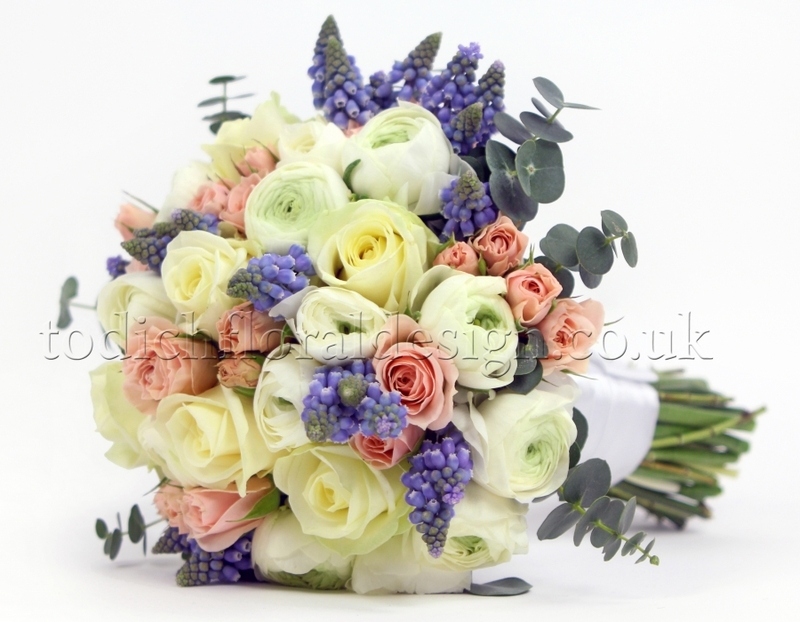 Today many choose flowers to complement the bride's and bridesmaids' dresses as well as the overall colour scheme of the wedding. 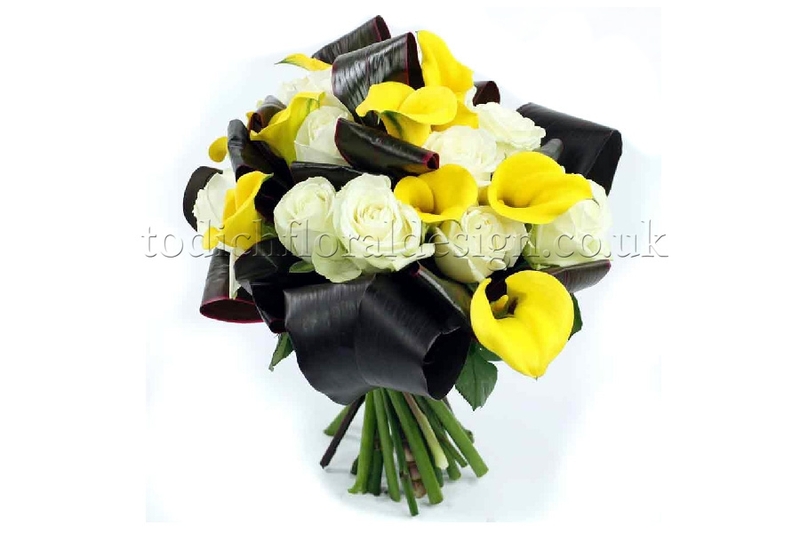 Bring a sample of dress fabric to Todich Floral Design to help us match colours correctly. 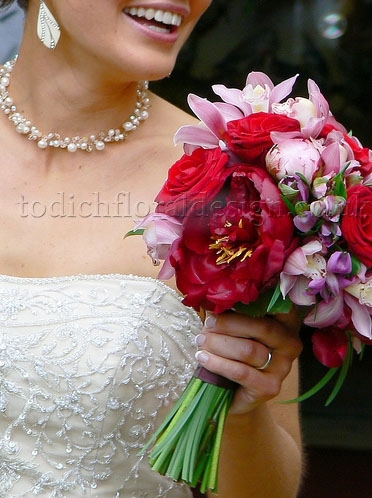 This should be done with white dresses also, as white can differ in shades and intensity. 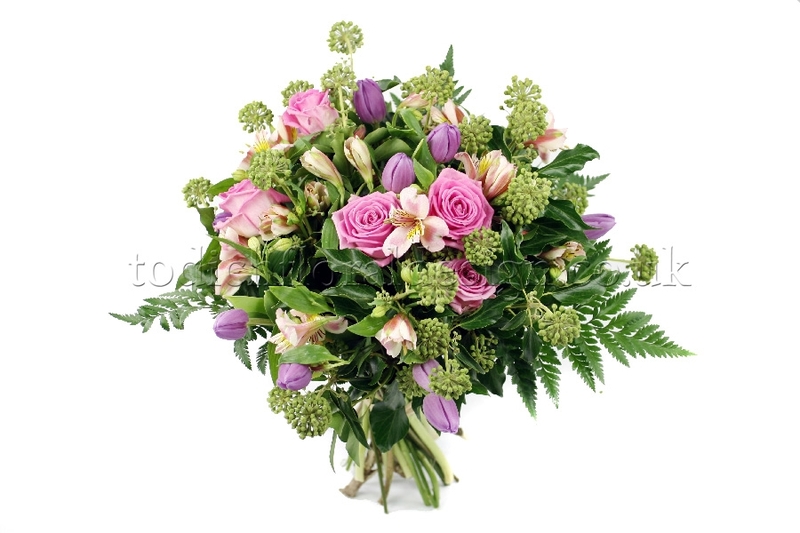 Remember that it is customary to give both mothers a bouquet or flower arrangement at the reception. 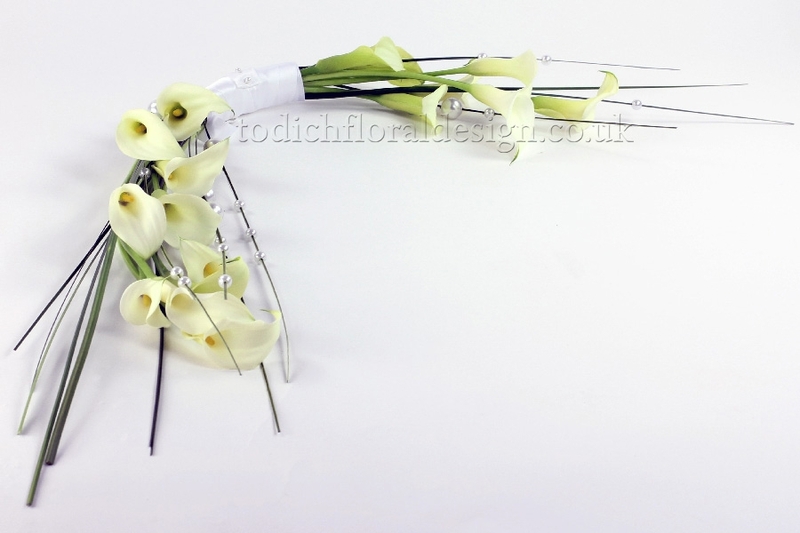 There are several classic shapes of bouquet and at Todich Floral Design we will be able to tell you which flowers best suit your desired bouquet shape.The most popular designs include the trailing waterfall shape and the round posy of flowers. 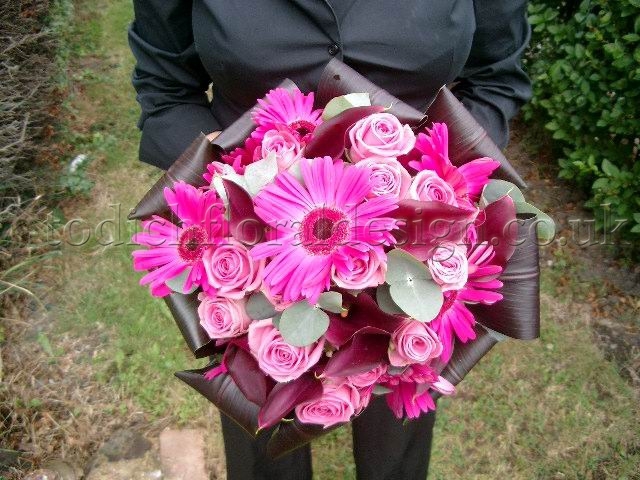 Bouquets that lie across the arm are also popular. 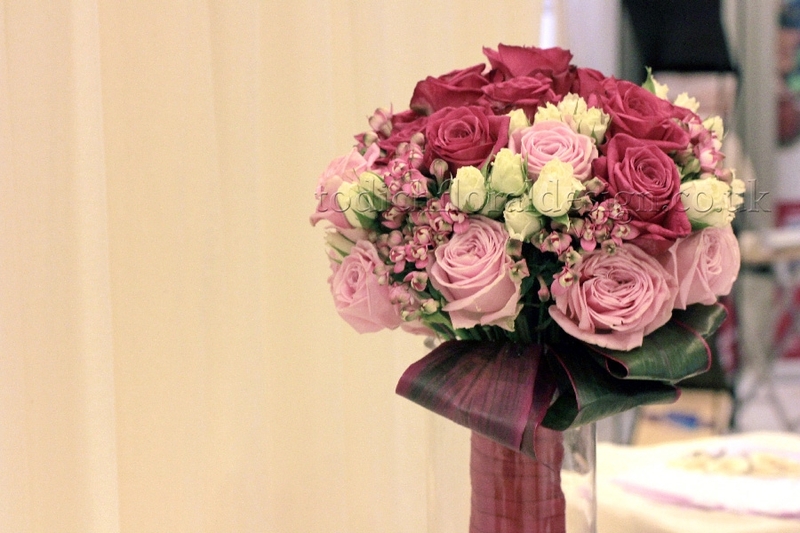 Your height can determine the kind of bouquet you should carry. 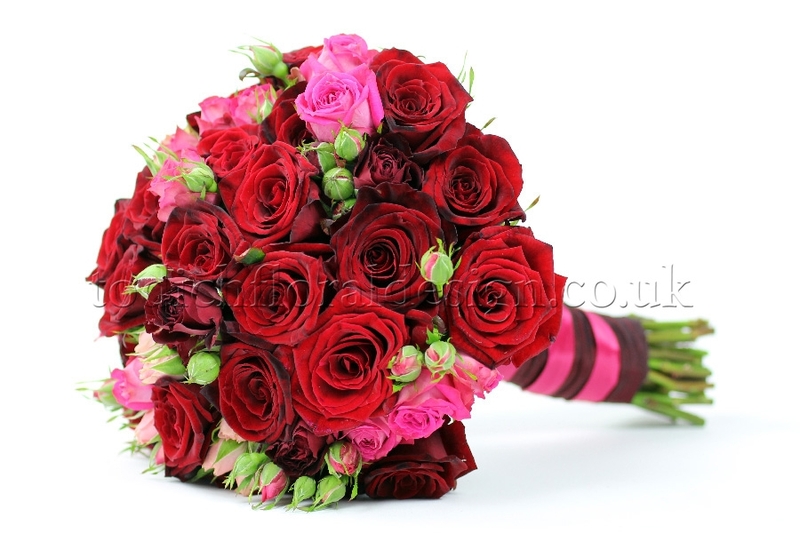 If you are tall, a long cascading bouquet would work well, but if you are shorter, a smaller one would be better. 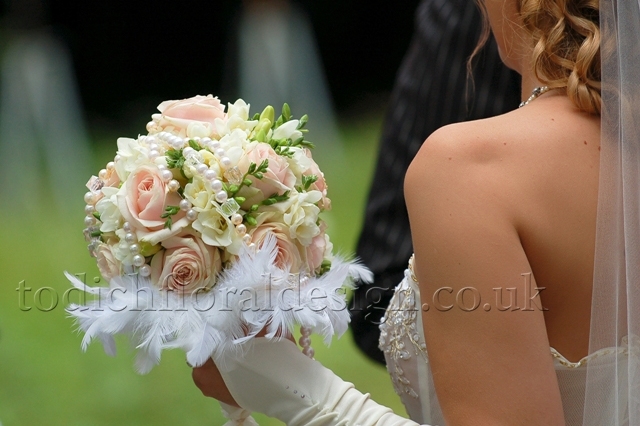 Also, take the style of your gown into consideration. 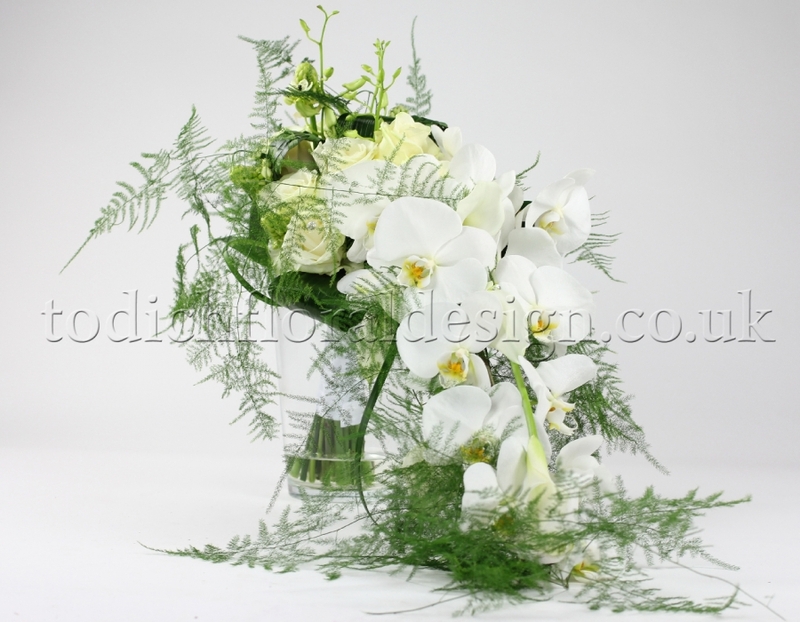 For example, a simple bouquet will complement a very ornate gown. 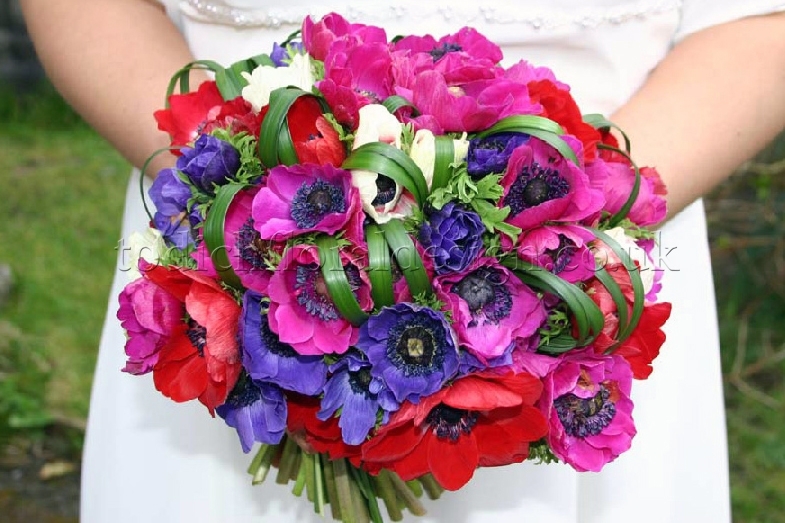 As a general rule large bouquets suit formal, long dresses while smaller bouquets or single blooms go well with a knee-length dress. 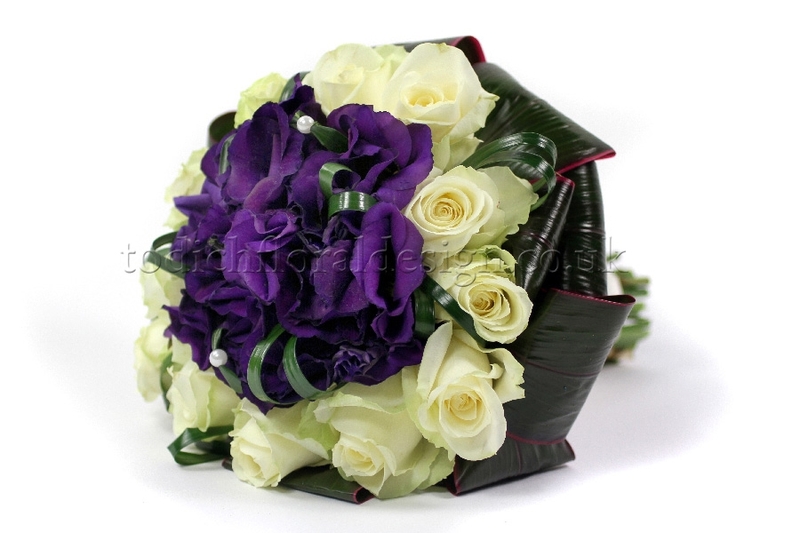 A matching bouquet and headdress can create a striking effect for both bride and bridesmaids. 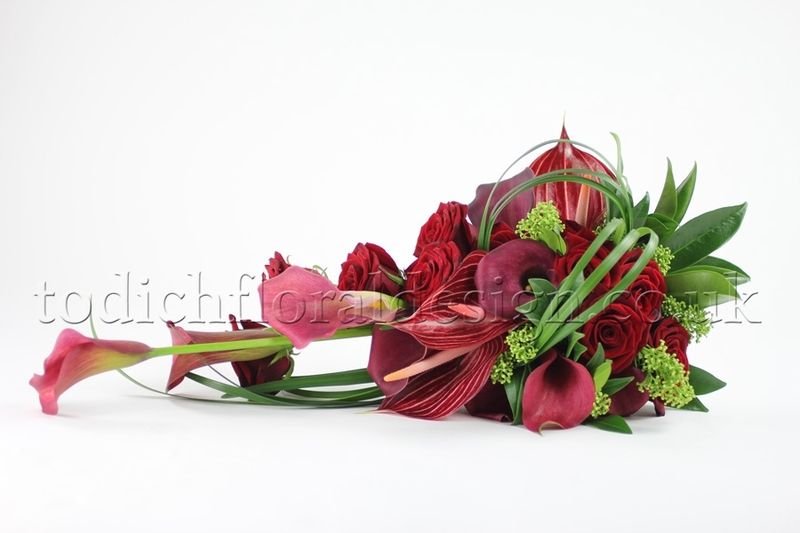 At Todich Floral Design we can help you select matching flowers that will enhance the overall look. 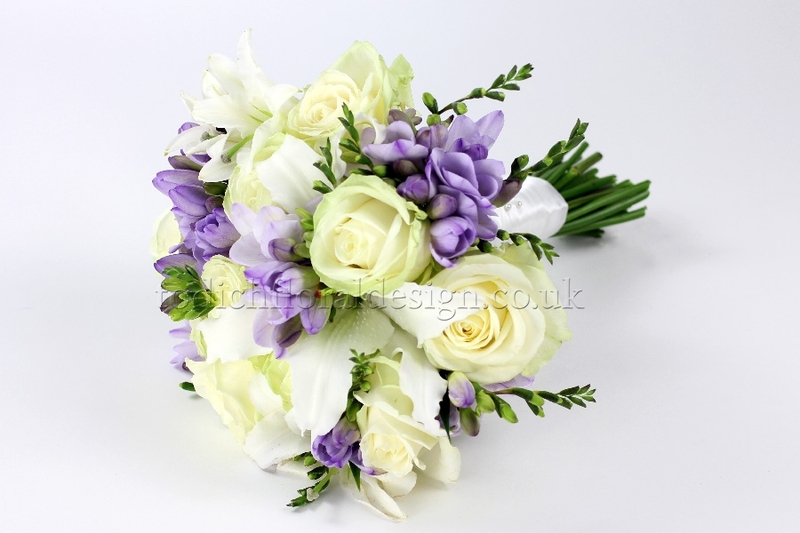 Bridesmaids' posies are usually smaller than the bride's bouquet and their colour and style should match or complement the overall scheme of the wedding. 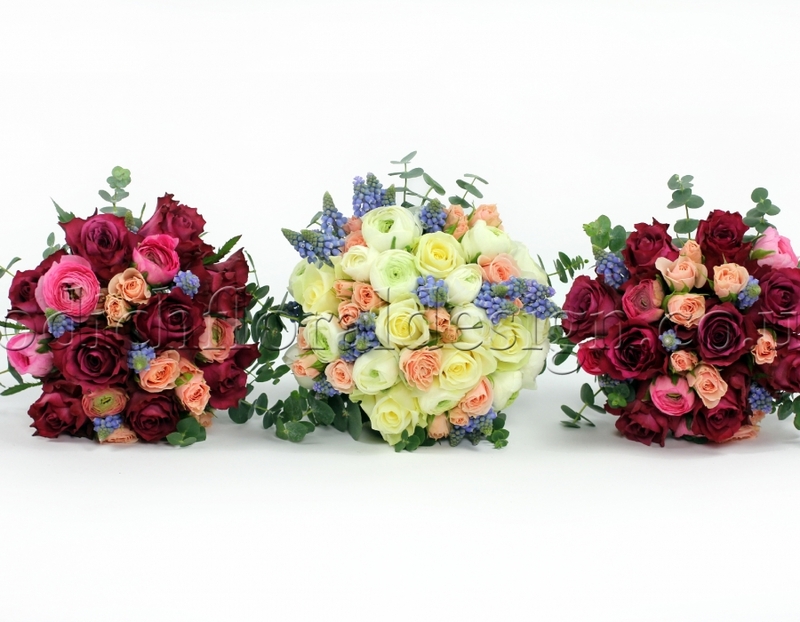 An alternative for younger bridesmaids is to give them a small basket of flowers. 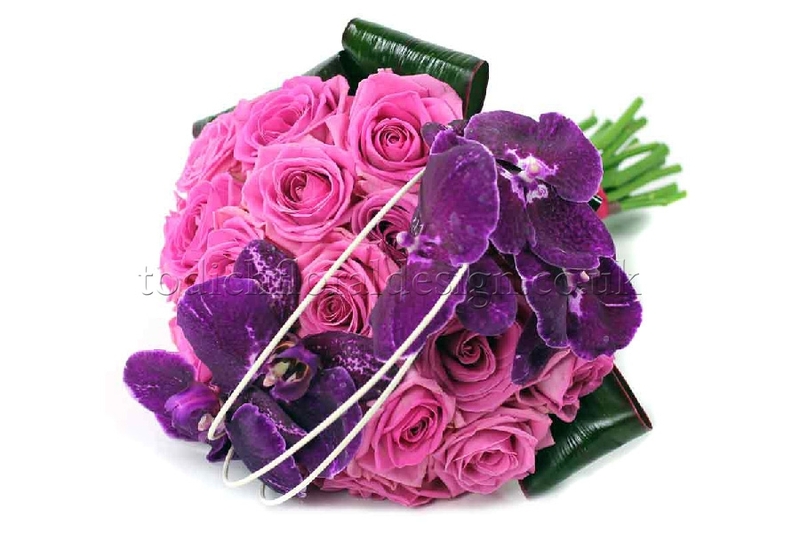 Corsages for the couple's mothers are small floral arrangements and can be worn pinned to a jacket or buttonhole or attached to a handbag. 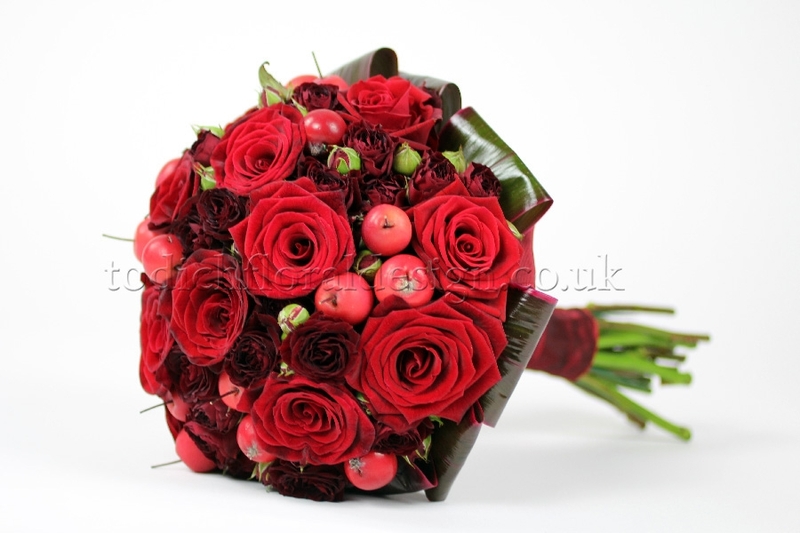 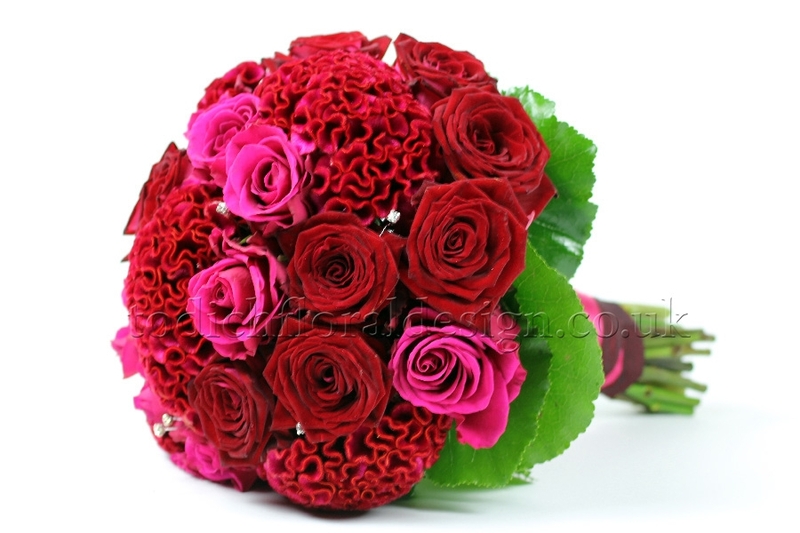 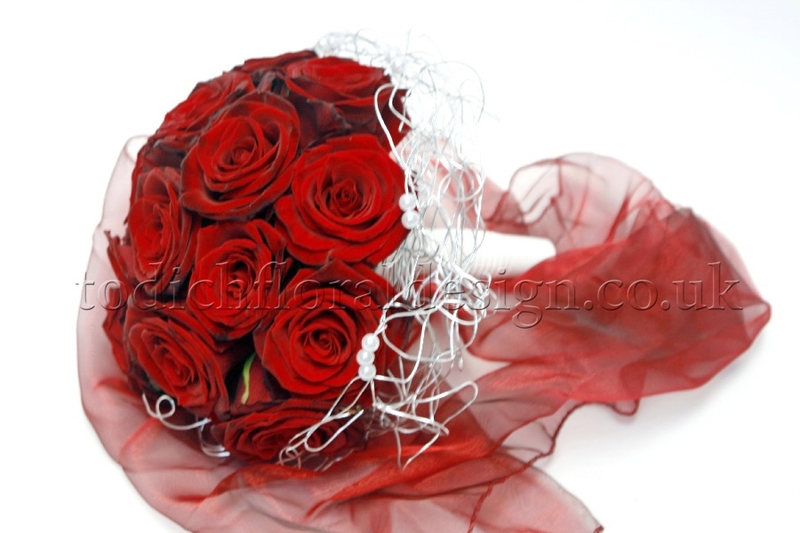 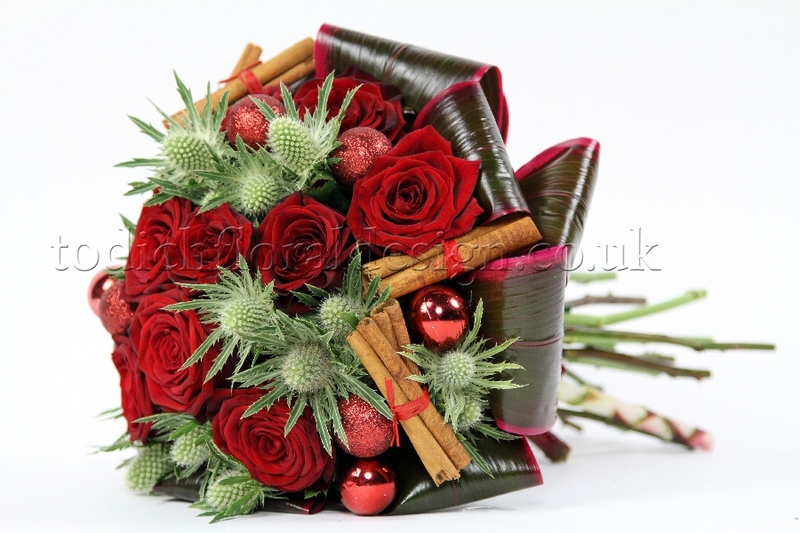 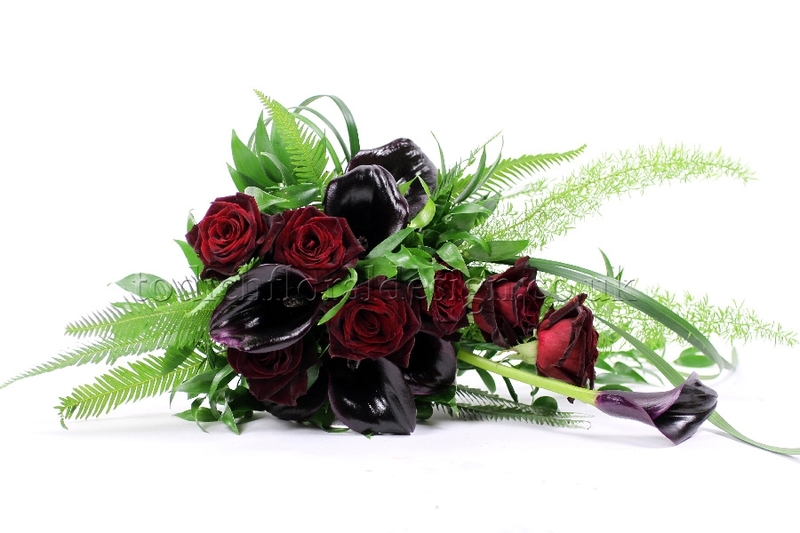 A neat corsage is also suitable for any female members of the wedding party as well as female guests. 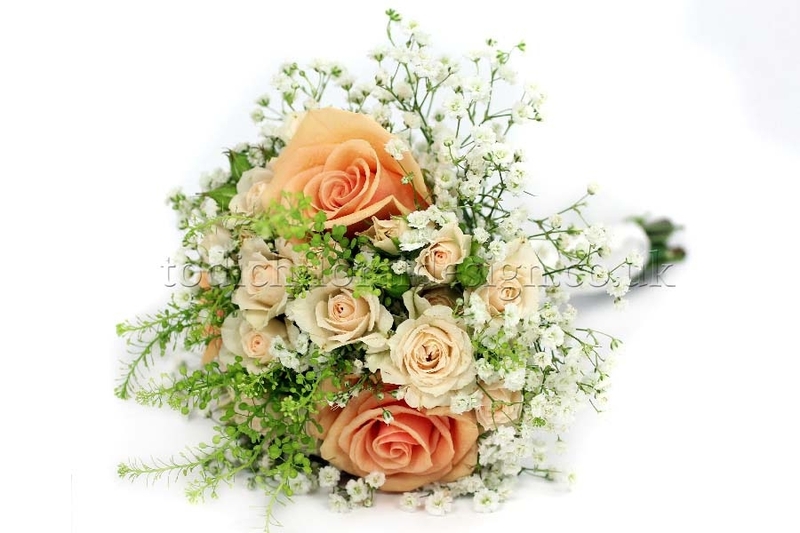 The groom often wears a flower in his buttonhole. 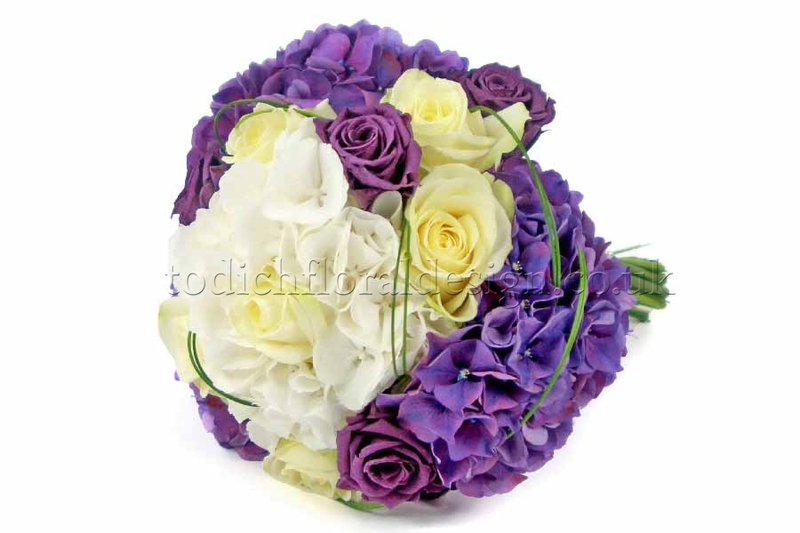 It is usually the same as one of the flowers that feature in the bride's bouquet. 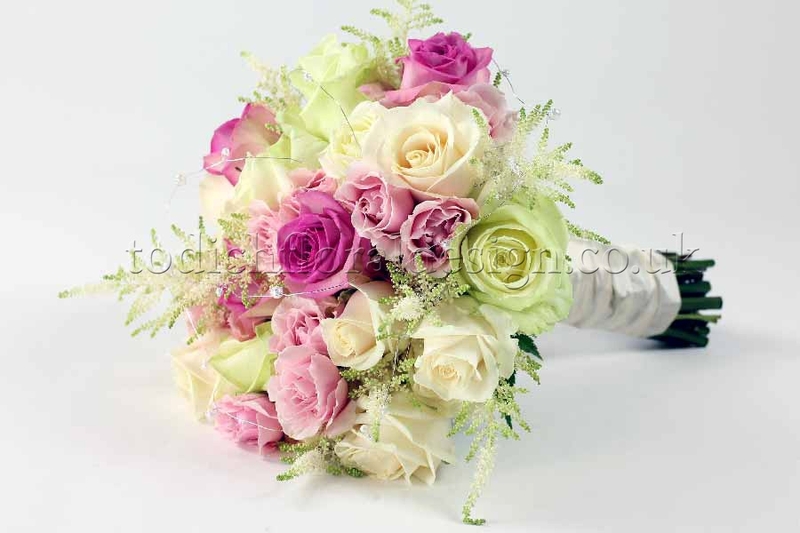 This goes back to the time when a knight would wear his lady's colours. 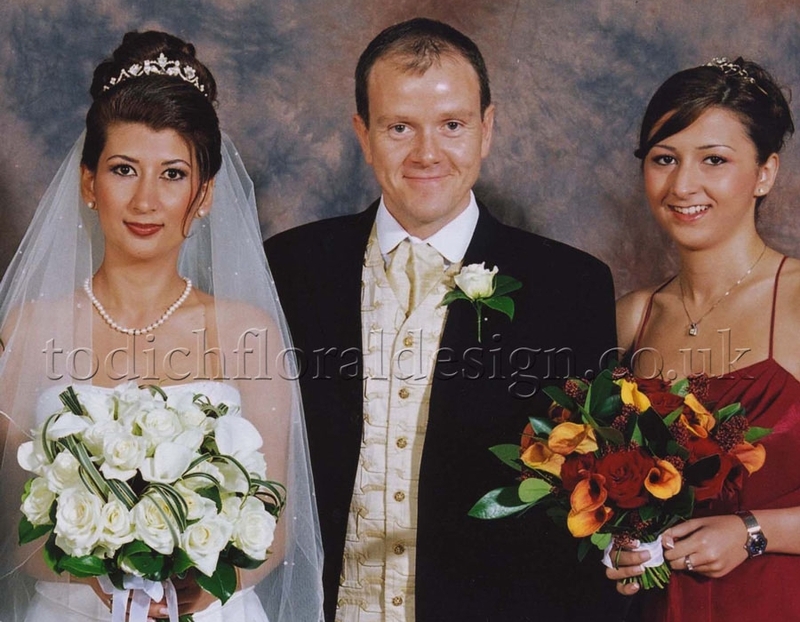 Key male members of the wedding party normally wear buttonholes on the left lapel of their jackets. 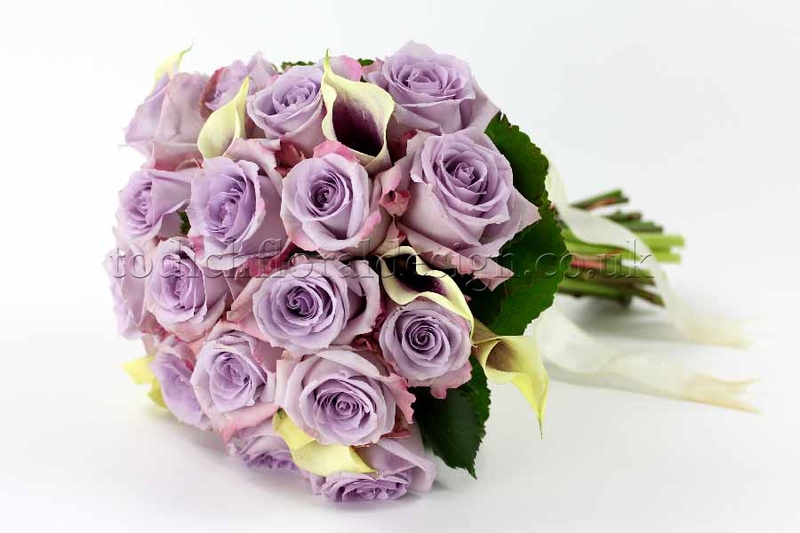 Fathers and the best man often wear roses. 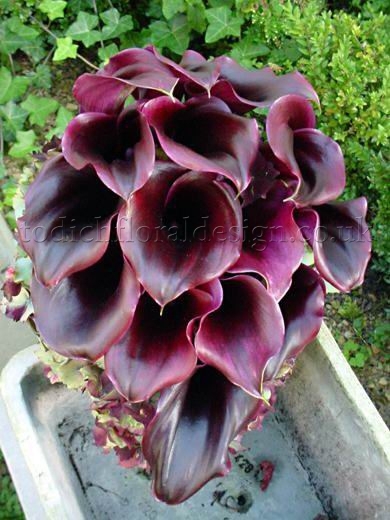 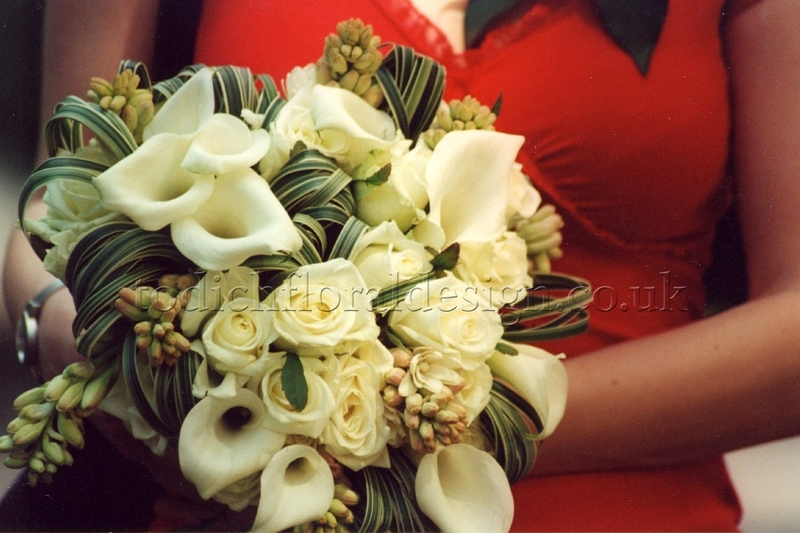 But different flowers can be used for buttonholes these days such as, cala lilies. 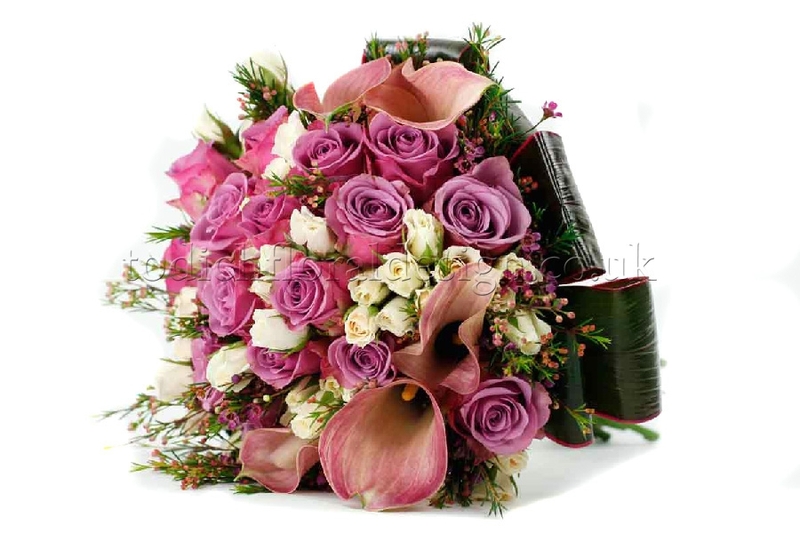 When decorating a church you should first find out what the church's policy is. 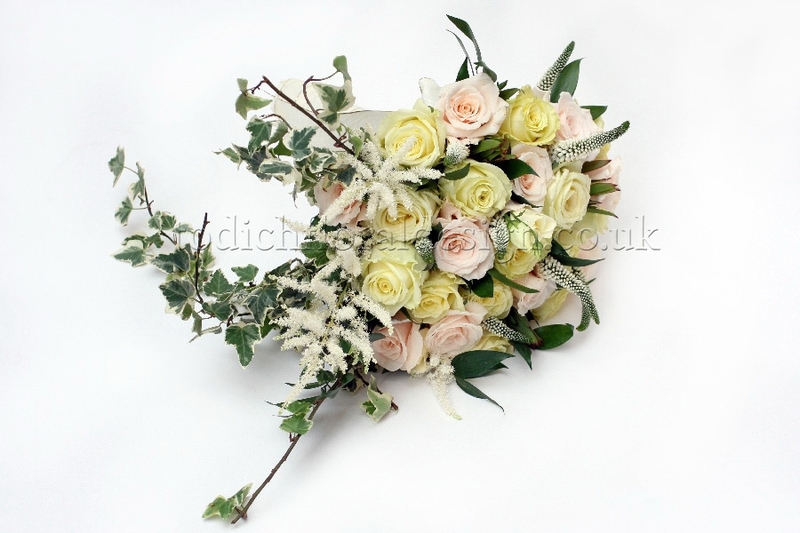 Alternatively contact us at Todich Floral Design and we can find this out for you and then advise on the best style of arrangements to suit the church and your wedding. 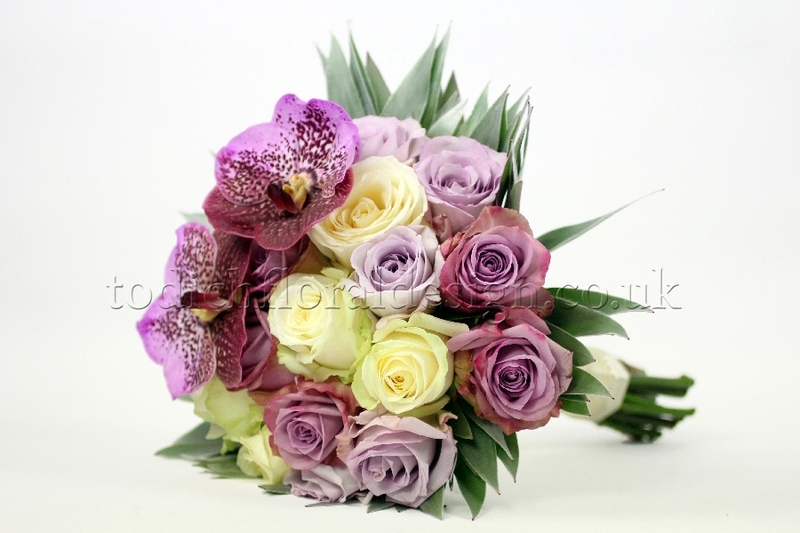 If your ceremony will be at a register office, it is also useful to find out what their floral policy is. 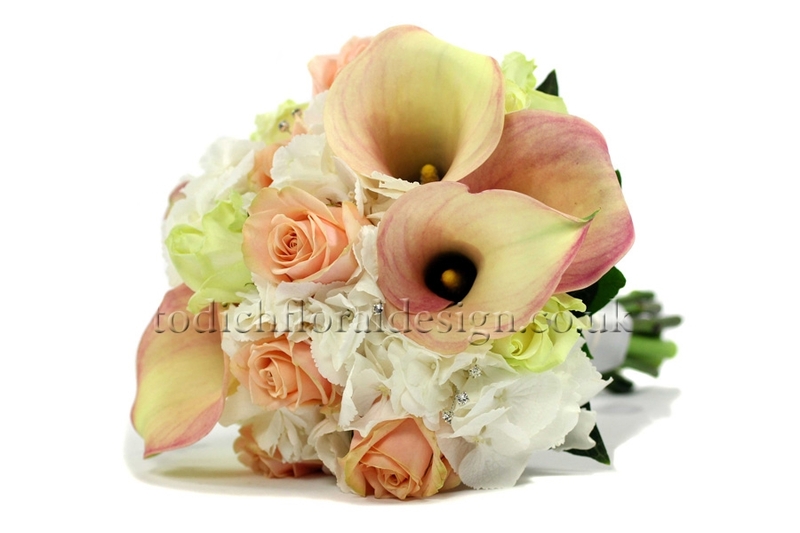 As with church weddings we can advise on what is most appropriate. 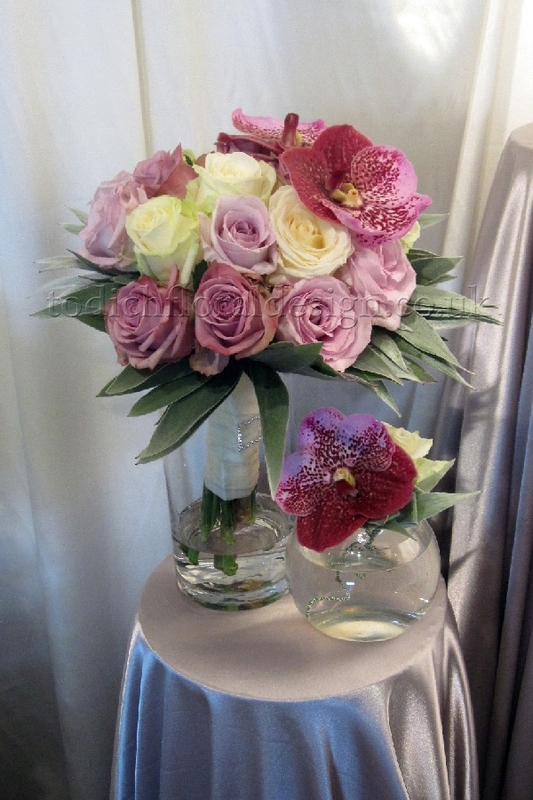 Floral decorations for your reception will probably include a large display just inside the entrance and arrangements for each table. 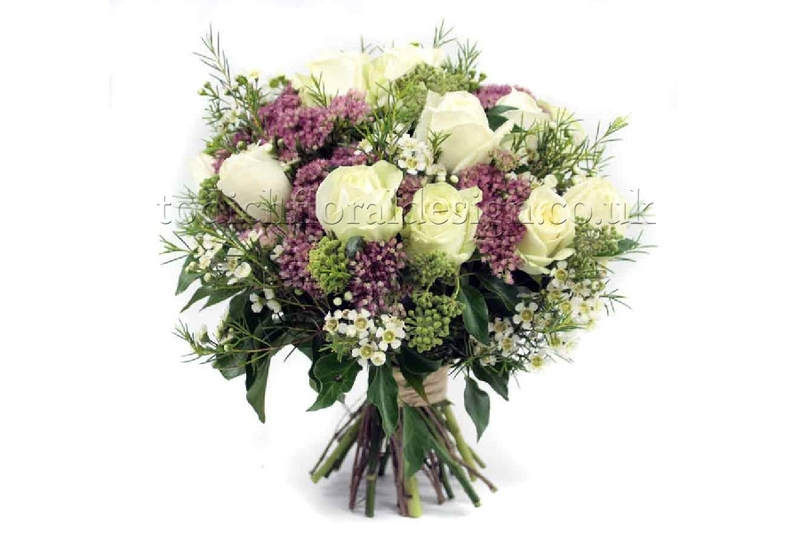 The wedding party table will feature a more ornate floral design. 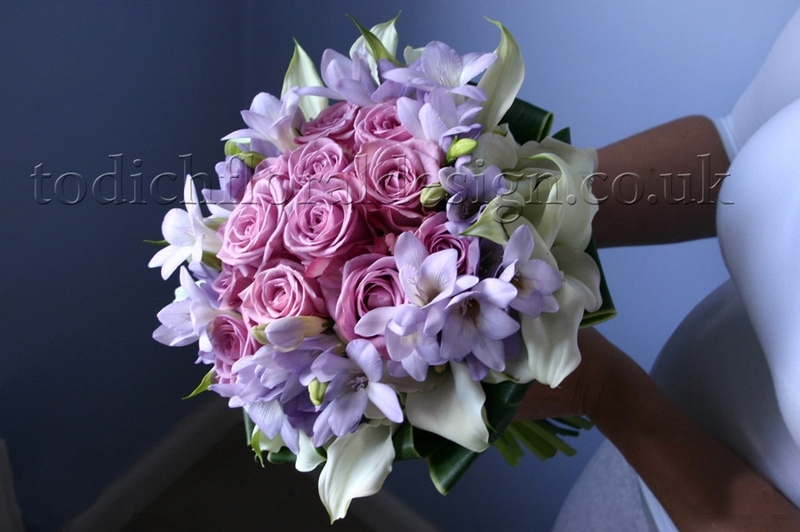 Why are wedding flowers so important? 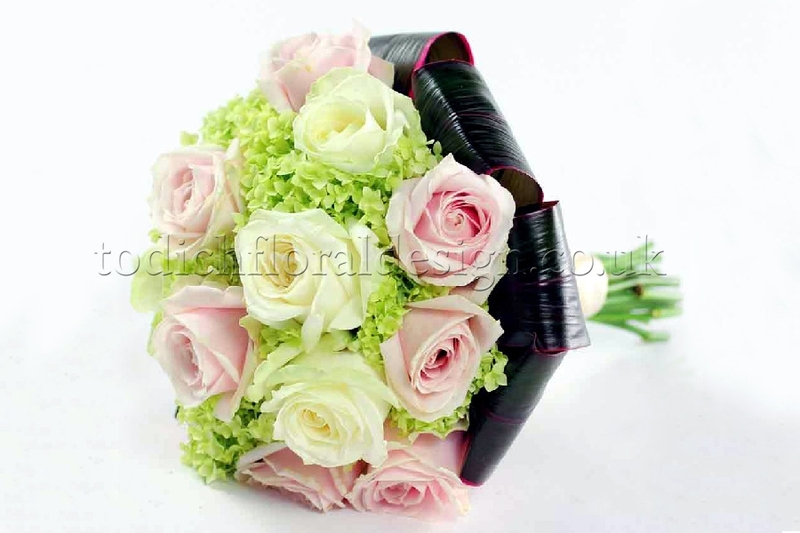 Flowers can make your wedding special and are the perfect way to symbolise blossoming love... 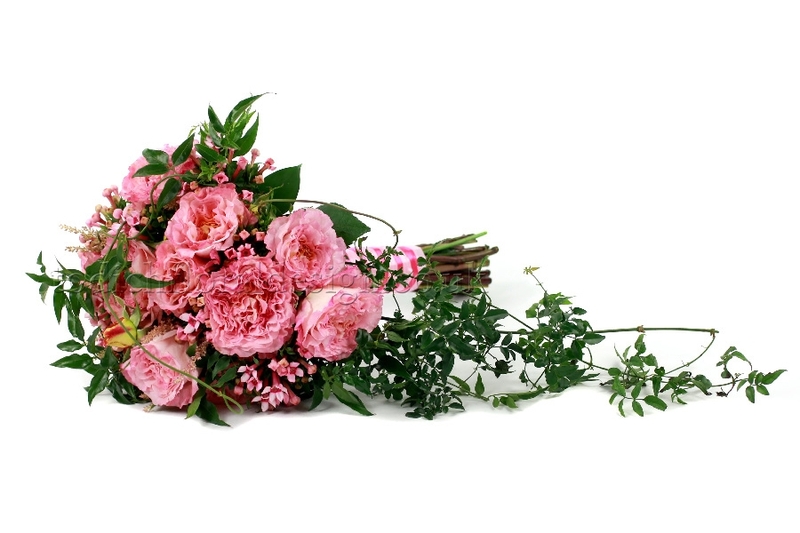 Choosing the right floral arrangements can help sustain a sense of beauty and sophistication throughout your wedding day. 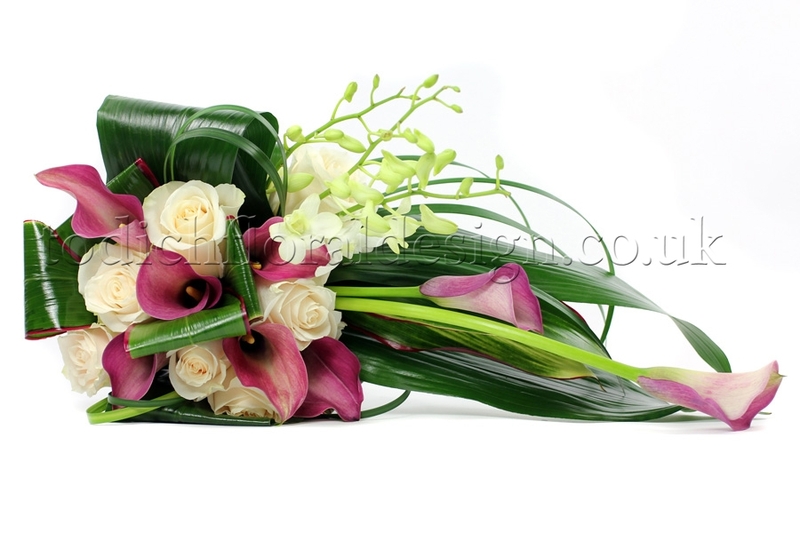 Flowers are a wonderful medium in which to reflect your style and personality. 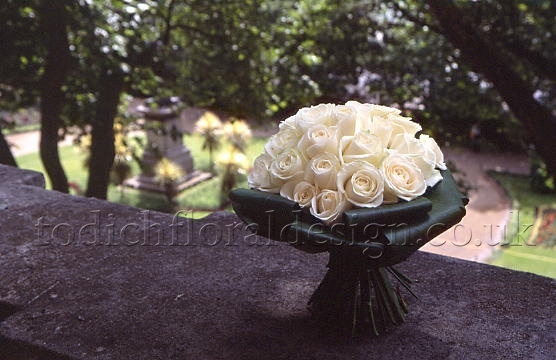 They also help to put your unique signature on the place where you hold your wedding. 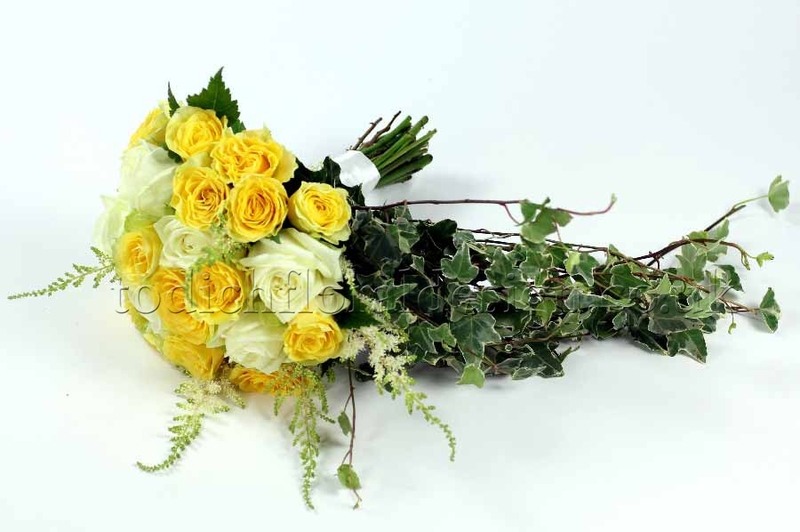 It is important to remember that whilst the event will last only one day, the photographs will capture the memories for the rest of your life and beyond. 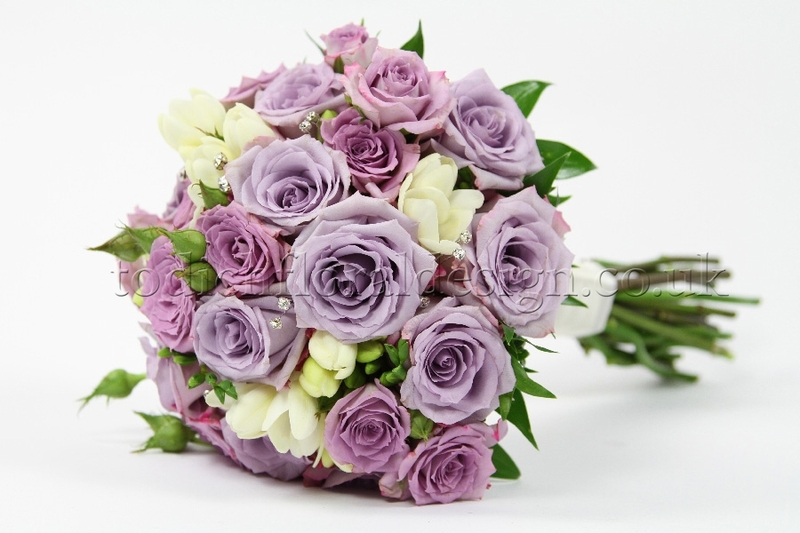 In this way, the flowers you select for your wedding are a long-term investment.